What is the most dreaded part of your work day? For many, it’s the seemingly endless stream of meetings to talk about other meetings that we have to set up. In the workplace, often times nothing gets done as a result of this bottleneck, which can stall progress for an organization and a career. 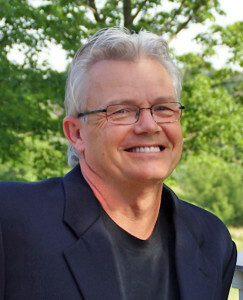 Fortunately, management expert Paul Axtell believes it’s time to make meetings matter again. 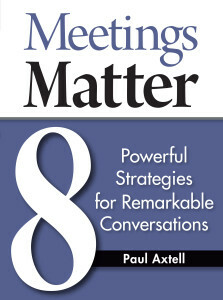 In his book, Meetings Matter: 8 Powerful Strategies for Remarkable Conversations, he asserts that meetings are the most powerful tool we have to get things done and offers actionable advice to realize their potential. I sat down with Paul and discussed his perspective and how people can begin to get the most out of their daily meetings. People are concerned with the amount of time they spend in meetings – and the lack of accomplishment that occurs – for good reason. In most organizations, meetings are ineffective and time consuming. I wrote this book to show that this doesn’t have to be the case. In fact, I would argue it’s not the meetings themselves, but the way they are run and the how people chose to participate in them. Why have meetings gotten such a bad reputation? As a result, the predominant mindset about meetings is negative, and that colors how people prepare and participate. The mind tends naturally to focus on the negative – what’s wrong, what’s not working – and look for more evidence to support that assessment. The way forward begins by choosing a more positive perspective: first, meetings do matter – they are high-leverage events at the heart of effective organizations. Second, choose ownership for each meeting you attend. Why are meetings so important to productivity? Meetings are at the heart of every effective organization and, if done correctly, are an opportunity to clarify issues, set direction, sharpen focus, create alignment, and move objectives forward. What is one thing leaders can change to make their meetings more meaningful? In my experience, most managers and supervisors don’t have the skills they need to make it a successful event – we simply have not made meetings a required competency. In its most basic form, a meeting is essentially a series of conversations. To maximize its impact, leaders need to produce the intended outcomes— to talk about the right things and make progress on every topic. In addition, it’s important to manage the participation levels such that the quality of the conversation is top-notch and people leave engaged and aligned. Set-up each conversation so everyone knows the intended outcomes and how to participate. Manage the conversation deliberately so that the discussion stays on track and everyone is engaged. Close the conversation to ensure alignment, clarity on next steps, and awareness for the value created. Bottom line: managers are the only ones that can improve the reputation of the meeting. A little effort can go a long way. It’s possible to be five times more productive, work less hours, and be less stressed—but not if you don’t master meetings. Fewer meetings would be nice but less time in meetings is what matters most. Check out Paul’s book, and learn more about how to get the most out of your teams and yourself.